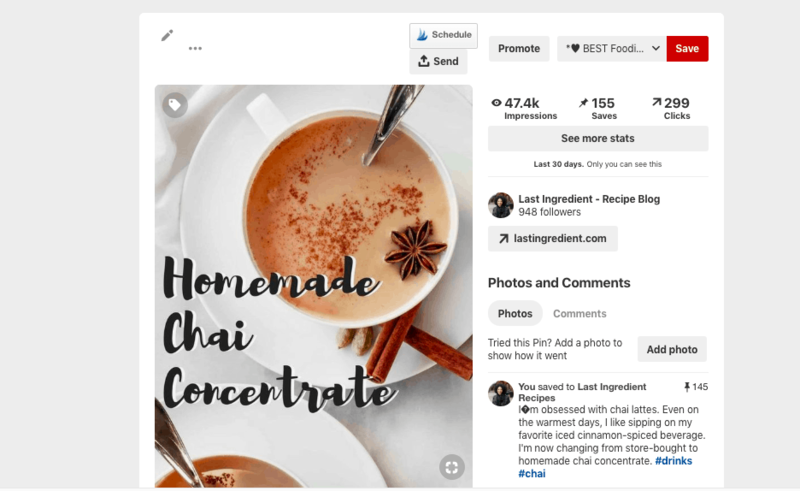 When I started working with Paige, the mastermind behind Last Ingredient, she was already an Instagram rockstar with over 50,000 followers, but her Pinterest looked nothing like the food blogger she was, it was mainly interior design boards. Her goal was to reach the necessary minimum to apply for a certain ad network. She knew that she needed to diversify her traffic and that Pinterest could be great, she just didn’t know what all to do and didn’t have the time to do it. Last Ingredient is a food blog, but Paige herself is an interior designer. Her Pinterest profile for Last Ingredient had only 3 or 4 food related boards and the rest were interior design related. While it’s perfectly fine to have personal boards on a Business Pinterest account, those personal boards should be secret boards. Sign up to join the community and receive my daily tips via email. 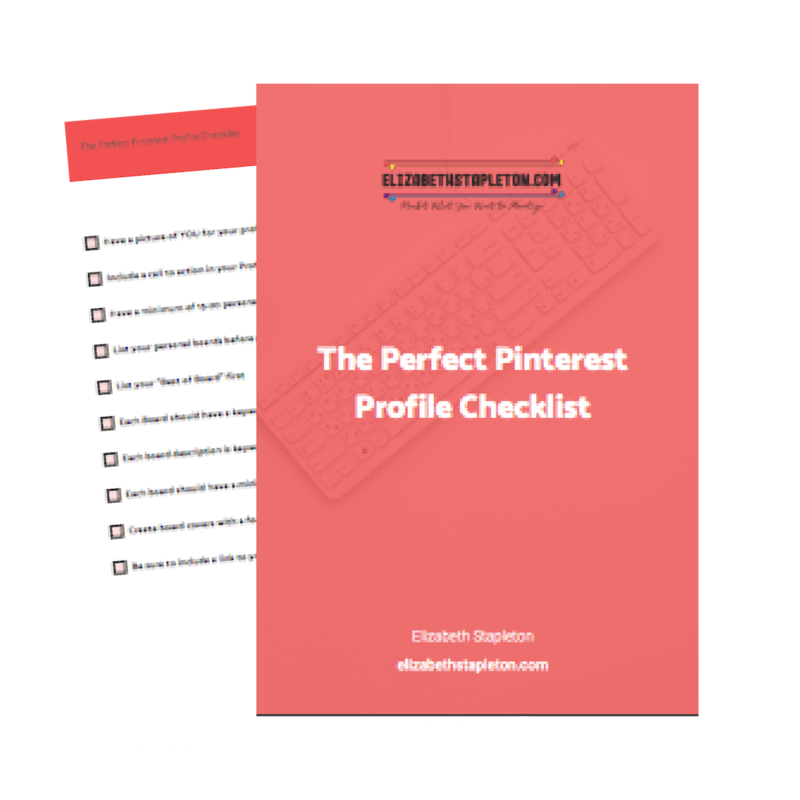 Community members get access to exclusive discounts and freebies like my Perfect Pinterest Profile Checklist! I made all the non-food related boards secret and created several new food related boards named based on the categories on her blog. I made sure to include keyword rich descriptions for each board and pinned several items to each so they won’t appear empty. Group boards can help to expand any Pinner’s reach. Every month I apply to niche specific group boards on Paige’s behalf. By niche specific, I mean they are food group boards, rather than just a general, “best pins” group board. Last Ingredient is now apart of 8 food focused group boards. Many of which have high virality and engagement scores. 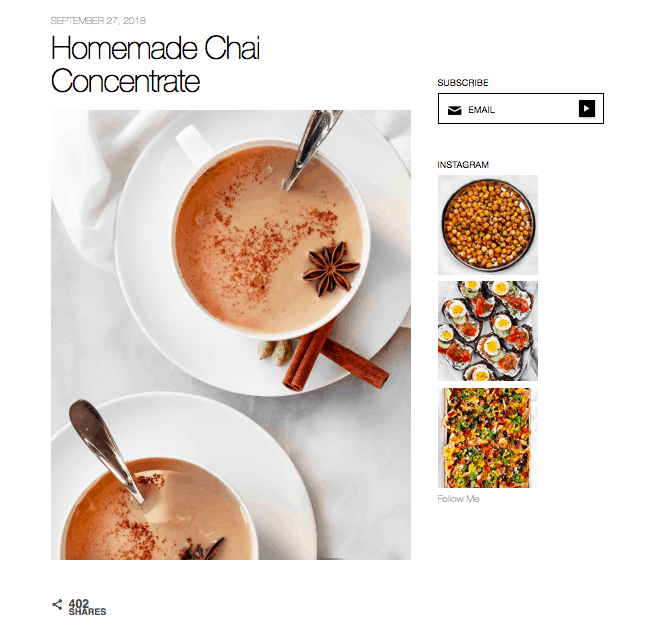 Last Ingredient has GORGEOUS photos, but for aesthetic reasons, the images on the site don’t have text and weren’t always the ideal size for Pinterest. Not wanting to change the look of the site, we created pin images using the original photos but did not add the images we created to the blog posts. So long as the reader can connect the Pin to the post, which is easily done via the focus of the image, it’s okay not to include text based Pin images in a post. Though I did encourage Paige to include a portrait sized photo in her posts to help with people pinning directly from her site. It’s no secret that Pinterest loves consistent Pinners. With Tailwind it’s easy to ensure you’re regularly pinning without spending all day on Pinterest. But even Tailwind requires some work. I make sure that Last Ingredient’s Tailwind schedule remains full and that a minimum of 50% of the content being pinned is from Last Ingredient. But Pinterest isn’t the only place where consistency has paid off. As a member of Tailwind, Last Ingredient also takes full advantage of Tailwind Tribes, pinning to and from them multiple days a week. The end of the year is basically food season. When I started managing Last Ingredient’s account at the end of August I immediately started focusing on pinning her content that people would want to find in the fall and heading into the holidays. This meant sharing soups, stews, chili’s, comfort food, holiday food and sides. Similar to when stores start putting out holiday stuff, you should start pinning to Pinterest a few months before the actual event to give those pins time to gain some traction. Now that it’s December, I’m focused on pinning healthier food as most people set a resolution to eat healthier in the new year. I’m also focused on pinning snacks and sides that would be great for New Years or the Superbowl. While Pinterest is fast, it isn’t over night and it usually takes a couple of months for Pins to start gaining traction, so plan ahead. Increasing your click through rate on Pinterest isn’t just about being consistent, it’s about being strategic too. Strategic in how your profile is set up, strategic in how much of your own content you’re pinning and in when you’re pinning that content.If you’re looking to get some help with your Pinterest account, I’m currently taking on new clients. Learn more about my Pinterest services and get in touch here. It feels good, because I feel like you’re in it with me, it’s a partnership and you want to see it grow and all these good things that happen as a result of, whether it’s Pinterest or something else from the blog attracting more attention, I really appreciate that. Subscribe to the newsletter today to get free daily email tips and access to exclusive discounts and freebies like my Perfect Pinterest Profile Checklist.